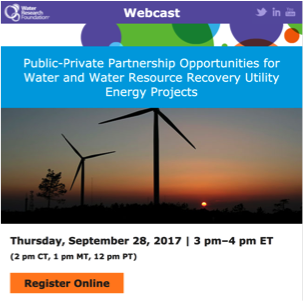 On September 28, WRF hosted a webcast where co-authors Sean McGinnis, Director of The Horinko Group; Emily Hammond, Senior Advisor of The Horinko Group; and Bruce Tobey, Of Counsel with PLDO, provided real-world insights on legal, financing, contracting, and risk management practices by reflecting on their water-energy marketplace research and various case studies. They also highlighted the characteristics, challenges, barriers, risks, incentives, and benefits associated with P3 energy initiatives at W&WRRUs. Their goal is to better position utilities to consider the use of P3s to achieve their infrastructure needs in the most financially and environmentally effective manner possible.